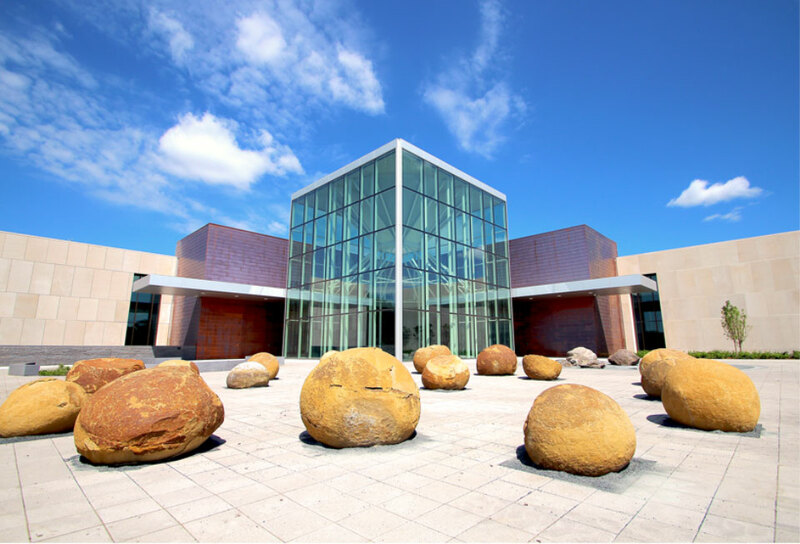 The 7500-square-foot outdoor space that greets visitors to the facility presents geological events across the state’s landscape—a water feature representing the prairie pot hole region, glacial erratics deposited by the last glacier, a 65 million-year-old petrified tree, and grasslands. A circle of 17 cannonball concretions showcases a unique geological feature. These large 56 million-year-old sandstone spheres formed in layers around an organic center, much like a pearl is formed around a grain of sand, and are the namesake for the Cannonball River. The 5766-square-foot outdoor space provides a more protected event space on the west side of the Heritage Center. An anchor spot for the Capitol Grounds Arboretum Trail, the Badlands Plaza provides great outdoor space for public and educational programs. This beautiful nature trail, constructed in 1985, gives a unique view of the mixing of nature, art, and architecture on the Capitol Grounds. It's a great place for a leisurely stroll or an educational walk. Along the west side of the mall, behind the governor's residence, the trail meanders through trees and shrubs. Posts identify approximately 75 different species planted on the grounds. In the summer, a myriad of flowers accents the green of the grass and trees. The trail passes statues and memorials which symbolize our state's history and heritage. Along the north side of the mall, the trail winds past the impressive Capitol Building. On the east side are the other state buildings--Department of Transportation Building, the Liberty Memorial Building, and the North Dakota Heritage Center. Adjacent to the Pembina River Plaza and new parking lot, the terraced amphitheater provides an outdoor venue for events such as powwows and community theater performances. The three-plus acres are ideal for large groups of children in year-round outdoor activities.